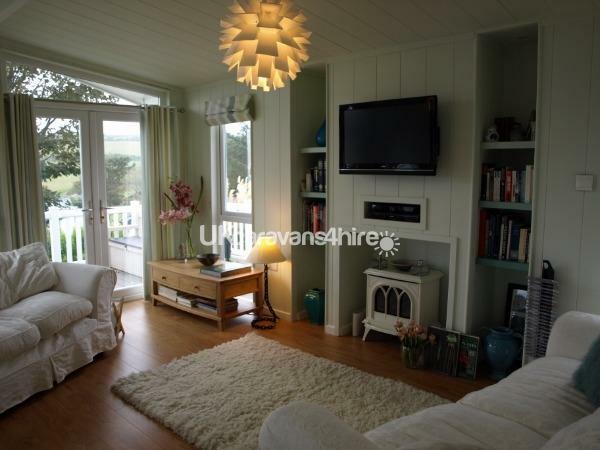 Additional Info: Prices start at £65 per night (£455 per week) off-peak in this stunning holiday lodge with sea view. Not to be confused with a static caravan this is a superior lodge, some say,"the best on the site"! Located on the well laid out upper area of Atlantic Rise with easy access to the golf course and Restaurant/reception. Modern, spacious, light and airy, warm and comfortable. Open plan kitchen/diner/living area. Oak furniture. New sofas. King size double bed, wardrobes, bedside cabinets table lamps, dressing table, ceiling fans, designer lighting. Large en-suite with bath, wc, basin and walk-in tiled shower. 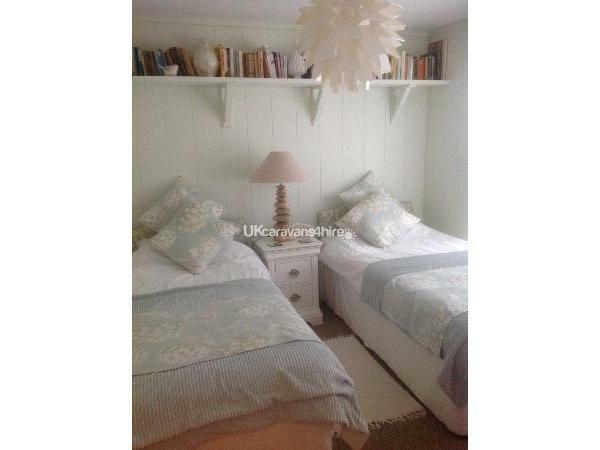 Full size 3' single beds in twin room, wardrobe, tall chest of drawers and bedside cabinet. Bathroom. Ample storage space.42" Flat screen TV in lounge with free view and theatre sound Blu-ray/DVD/CD player. i-pod docking station. Wi-fi. Fully equipped kitchen with electric oven, gas inset hob, cooker hood, microwave, dishwasher, washer-dryer, fridge-freezer, food processor, kettle, tea pots, cafetiere, pots, pans, crockery, cutlery, utensils. Laminated wood floors; carpeted in bedrooms, ceramic tiles in bathrooms. Bed-linen and towels provided but not beach towels. 5 nights minimum stay standard (7 nights minimum booking during the summer holidays) - unless we have a small window of availability between bookings, in which case we may offer shorter bookings). Prices are set at low, medium and high season. Please contact us for up-to-date prices. Reservation is secured with payment of a 25% booking deposit which is non-refundable, although it may be exchanged to another week in certain circumstances. A refundable deposit of £200 against damage is also requested upon payment of the balance, returned in full or part within two weeks, usually days, after end of the holiday subject to any losses or damages. The balance is due 12 weeks ahead of the holiday and we have a cancellation policy. 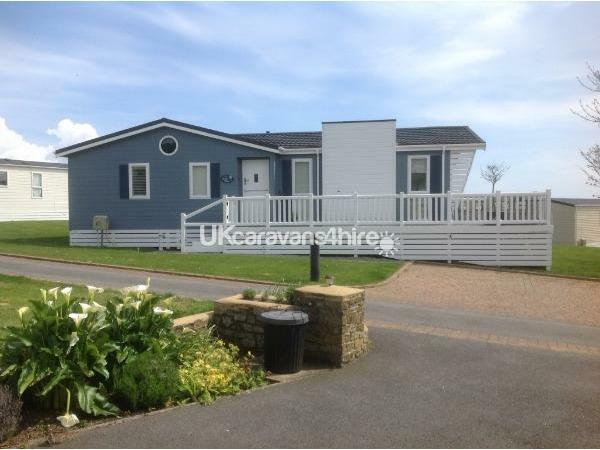 Praa Sands Holiday Park has everything one could want from a holiday site if you enjoy golf, beach activities, surfing, fishing including wreck fishing readily available near-by; a bar, restaurant, indoor pool with Jacuzzi and steam room and gym. 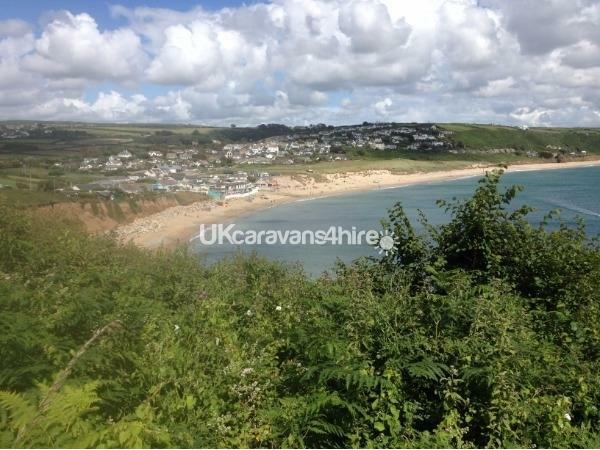 And it is centrally located for many beautiful villages, towns and attractions in South Cornwall (see more below). Nor is it too far to travel northwards to Poldark country or the Eden Project. 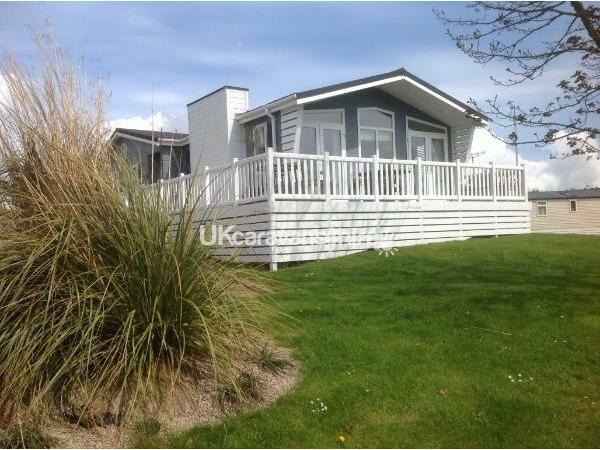 It offers not only attractively laid out static caravans but also superior lodges including the one advertised here. The Lodge is just 10-15 minutes’ walk from the fantastic Praa Sands beach. There is a 9-hole golf course with stunning sea views on site, along with Clubhouse restaurant/bar and terrace with sea views, swimming pool, jacuzzi, steam room and gym. Prices start at £65 per night for 5 nights’ min stay for up to four people (There is a 7-night minimum stay during the summer and Xmas holidays) - we may offer shorter stays if we have a small window of availability between bookings. 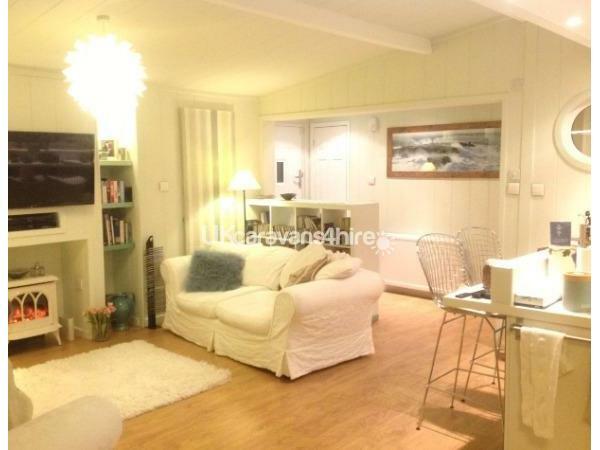 This centrally heated, double glazed Tingdene Beach House, with its unique open, spacious, very light and airy look has all the comfort of home with the bonus of countryside and sea views, good site facilities and minutes from the beach. It has an outside deck with bench seats, table and 6 chairs including 2 recliners. Inside - the kitchen living room is open plan and flooded with natural light. It has laminated wood floors, a soft rug and a feature fire. 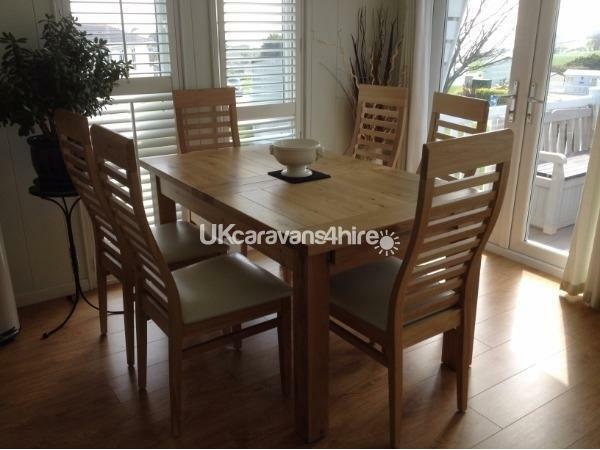 Look out to sea from the oak dining table with 6 chairs. Lounge area - spread out on the two new Ektorp sofas, enjoy a drink from your glass or cup resting on an oak side table and listen to music from your i-pod through our docking station or from the theatre-sound Blu-Ray/DVD/CD player. Watch a film or Free-view TV on the large flat screen, 42" Panasonic. Or check your emails with the Wi-Fi. Main Bedroom has a king size sleigh bed (topped with memory foam mattress) wardrobes, bed-side drawers and dressing table providing plenty of storage space. The room is well - lit with table lamps, concealed ceiling lighting and recessed down-lighters. There is an electric ceiling fan and a super en-suite with wc, basin, roll top bath, large tiled walk-in 2-head shower, towel radiator and abundant shelf space for all your toiletries. Second bedroom is lit by one pendant light and a table lamp set on the bedside cabinet between two comfortable full-size (3') single beds. Storage is provided in a wardrobe and a tall chest of drawers. Both bedrooms are carpeted. Outside the second bedroom is the bathroom accessible from the corridor leading to the bedrooms from the living area. In this corridor we have the central heating thermostat where you can control the temperature of the home while you are there. The boiler cupboard contains the vacuum, brooms, etc. There is also an airing cupboard and another cupboard by the front door with space for coats and shoes. 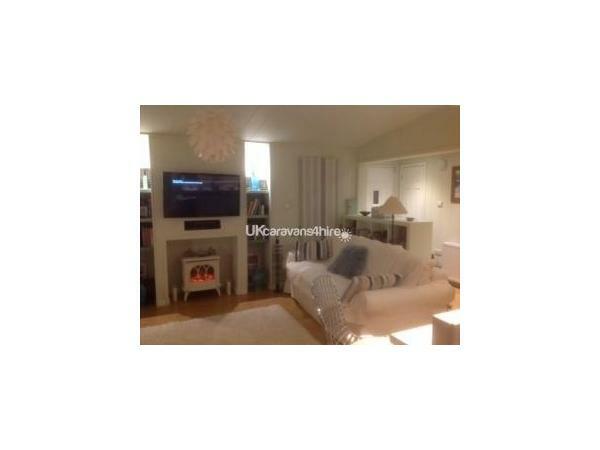 Kitchen equipment: appliances include electric cooker, inset gas hob, cooker hood/light and extractor. Microwave oven, toaster, dishwasher, washer dryer, fridge/freezer, food processor, kettle, tea-pots, cafetieres, pots, pans, crockery, cutlery, utensils. 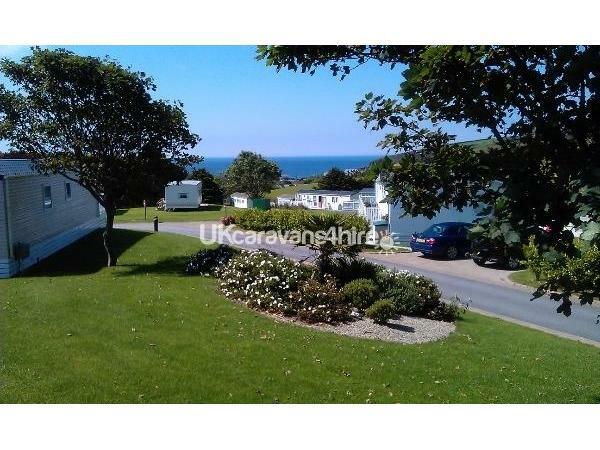 This is a prestigious site with a mixture of large static caravans and superior lodges set in lovely greens with palm trees and planting, adjacent to a 9-hole golf course, surrounded by fields and looking towards the sea just a few minutes distant. The reception area houses a gym, indoor pool, steam room and Jacuzzi. There is a restaurant and bar with outside terrace looking towards the sea and small children's play area. This is a quiet site with easy access to many attractions in the area. Closest, within walking distance, is Praa Sands beach with its surf school, beach cafe, shop and the very popular Sand Bar; a restaurant & bar over-looking the waves. Nearby, 5 miles, is the fishing harbour village of Porthleven with boats, studios, craft shops, a regular craft market and a number of highly acclaimed restaurants. Just two miles from here is Helston, the ancient tannery town famous for the Floral Dance (or Furry Dance) all day through the town on May 8th every year. Nearby, Flambards, the Gweek Seal Sanctuary and the Helford River. A short way south leads to Mullion and the Lizard Point, Cadgewith and Coverack, further, in a north easterly direction is Falmouth, the Roseland, Truro, then to St Austell Bay, The Eden Project, Charlestown, Daphne du Maurier country - Paa and Fowey. Northwest to Poldark Country. In the opposite direction from Praa Sands just 4.5 miles brings you to Marazion and St Michael's Mount. Then to Penzance, Newlyn, Mousehole and on to Land's End. St Ives is just 14 miles - half hour drive away from Praa Sands. A car or bikes are an advantage although Prothleven, Paranuthno and Marazion can be accessed on foot and a regular bus service runs from Praa Sands on average every 20 mins to Penzance (town and station), Helston and beyond, stopping at villages on route. Additional Info: The indoor swimming pool is the same depth throughout and ideal for learners as well as experienced swimmers. Children under 16 years of age must be accompanied by an adult, attached to the pool is an infant pool. There is also a steam room and a Jacuzzi but these are for adult use only. Membership passes are provided with the rental. Social events organised in the clubhouse/restaurant, children's outdoor play area.There is a pleasant (in summer!) outside terrace from the Restaurant looking onto a practice golf area and children's playground and down past the park to the sea.